Israeli soldiers shot, on Friday at dawn, seven Palestinians, including one with live fire, caused at least eighteen others to suffer the severe effects of teargas inhalation, and abducted one in Nablus, in northern West Bank. Several armored military vehicles invaded the city from many directions, and fired dozens of live rounds, rubber-coated steel bullets and gas bombs at Palestinians, who protested the invasion, and hurled stones at the soldiers. Several gas bombs also stuck homes in the invaded neighborhoods, causing many Palestinians, to suffer the effects of teargas inhalation. The military invasions targeted many neighborhoods in the Old City of Nablus, the eastern neighborhoods, in addition to al-Qaryoun and al-Qisariya neighborhoods. Medical sources have confirmed that the soldiers shot one Palestinian with live fire, six others with rubber-coated steel bullets, and eighteen who suffered the severe effects of teargas inhalation. In addition, the soldiers invaded and violently searched many homes, and abducted Mohammad Hamami, 20, from his home in al-Qaryoun neighborhoods. The soldiers also occupied rooftops of several invaded homes, and used them as firing posts and military towers, in addition to puncturing the tires of many parked cars. 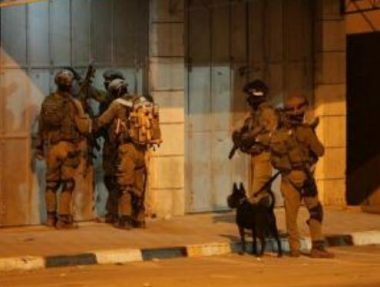 It is worth mentioning that the army has been carrying out ongoing nightly invasions and violent searches of homes in Nablus, especially the Old City. In related news, the soldiers installed a military roadblock at Deir Sharaf Junction, west of the city, stopped and searched dozens of cars, and interrogated many Palestinians while inspecting their ID cards. 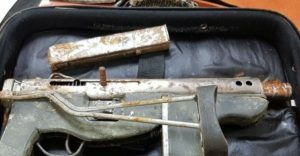 In occupied Jerusalem, the soldiers abducted a young Palestinian man after locating an old and rusty rifle buried in his yard and moved him to an interrogation facility.